Stud Muffins are deliciously tasty treats that have been handmade using the finest human grade raw materials to ensure the best for your horse. Containing a host of wholesome ingredients including Oats, Barley, Wheat, Molasses, Linseed and Fenugreek, Stud Muffins Treats are as tasty as they are healthy, and will also help to promote a shiny and healthy coat. 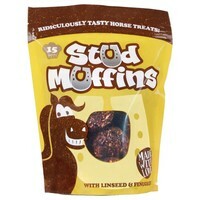 Stud Muffins come in a specially designed pack to ensure they are as fresh as the day they were first baked.